With less than five weeks left to go in the session, Lt. Gov. David Dewhurst sat down with the Tribune to talk about his future political plans, the status of the budget in the Senate and in the biennial parley between the Senate and the House, redistricting and the tug-of-war over the Rainy Day Fund. With less than five weeks left to go in the session, Lt. Gov. David Dewhurst sat down with the Tribune to talk about his future political plans, the status of the budget in the Senate and in the biennial parley between the Senate and the House, redistricting and the tug-of-war over the Rainy Day Fund. An edited transcript follows. TT: Are you going to run for governor or for U.S. Senate? Dewhurst: I am 100 percent focused on this session, and I don't think I need to be distracted right now. I have given it a lot of thought and talked to my wife about where I might be able to, in her judgment and mine, best serve Texas in the future. And we've reached a conclusion that we'll be talking about in probably the second half of June. TT: Is all of this a distraction for the members? Dewhurst: Sen. Kay Bailey Hutchison announcing that she's not going to run for reelection, Gov. [Rick] Perry traveling around the country giving speeches and chairing the Republican Governor's Association, the number of candidates out there for different office — I haven't thought about that. It hasn't had any influence on me one way or the other, other than I'm acting governor more than I was several months ago. I don't think it has any influence on the members, because it's not affecting me. If it was affecting me, then it would be telegraphed to the members and it would have an effect. TT: Do you expect special sessions to finish the Legislature's work this year? Dewhurst: I hope we're not in Austin for special sessions this summer, but I don't think it makes much difference. If we are, and I have announced, for instance, that I'm going to run for governor or that I'm going to run for U.S. Senate, I don't think that's going to have much bearing. So far, we've always been able to reach an agreement. In my first session in 2003, Speaker [Tom] Craddick did have me concerned that we weren't going to get our final budget printed on time, but somehow we were able to get it printed. TT: How do you close this gap? Dewhurst: The House passed a budget at $77.5 billion. They've passed a bill with $3.5 billion in non-tax revenue, so they're coming up, and we're at a good number for the Senate. I'm not surprised, but I went to the Republican caucus [Tuesday] night, and the Republicans feel very, very strongly that it's important to put another $6 billion in education in order to fund what Gov. Perry's own appointee as commissioner of education, Robert Scott, has said is the minimum — the bare bones that we need. I'm not one to throw money at any problem. That's why we're resisting lowering standards in the Senate. If we're going to stretch and put the funds in to support our public schools and to keep our good teachers from being laid off, then we want to all work together and make sure our schools are getting better. We're not numbing down our standards. TT: You're cutting the budget, and yet you're positioned as the big spenders in this debate. Dewhurst: We're not. My first day as Land Commissioner I laid off 16 percent of the workforce. I reduced the budget some 20-plus percent, turned money back each of the two bienniums I was Land Commissioner. Came in in 2003 when we had, arguably, a $10 billion shortfall and worked with the House to cut spending and balance. In five of the last nine years that I've been lieutenant governor, we've either cut spending or dramatically reduced taxes. TT: How do you reposition this? Dewhurst: The Sunday night that the House passed the budget, Chairman Jim Pitts of the House Appropriations Committee was quoted as saying, in essence, "Help, Senate. Increase public education and help fund our nursing homes." Most Texans don't want to see tens of thousands of good teachers laid off, which means that we will have to dramatically increase class size in our middle schools and high schools in order to move some of those teachers down into elementary schools. They don't want that. They want good schools and they want great educations, and that's what we want to fund. The school districts are still wanting more money. They're claiming we're $4 billion short. We're not. We're still hearing from the education lobby that we're underfunded, but I don't think so. The LBB just finished a study. Even on the heels of a national recession, as Texas is climbing out, with reduced local property values, which means reduced local school property taxes going to the independent school districts — even with that, the Senate-proposed budget appropriation is still a half a billion dollars above what our public schools are receiving for this current biennium of 2010-2011. It's not that the Senate wants to spend money. The Senate wants to meet state law. The Senate wants to give our kids a good education. In Article Two [of the state budget], which is our Medicaid and our health and human services area, Gov. Perry's hand-picked commissioner, Tom Suehs, also an excellent person, is telling us that under federal law, we owe up to $7.5 billion, and it's pay me now or pay me later. We don't have a choice in this. Our plan is to fund enough that we can keep going through the time that we can come back into session and we can see if the cost-savings provisions that we're putting into the budget have been successful. If there is not [enough money in the budget], we're going to park and leave in the Rainy Day Fund — we're going to cover, dollar for dollar — the obligations even if our cost-saving measures are not fruitful. TT: Can you do this without the contingent Rainy Day Fund? Dewhurst: We can if we go back and take a second look at some of the non-tax items that are on the Senate Finance Committee's list. And, of course, that can be made easier by going back and taking a look at a few of the cuts in non-priority areas. I'm not talking about public education. I'm not talking about higher education. I'm not talking about Medicaid, but other areas where there could be some savings. TT: What do you expect in redistricting? How many senators are running for Congress? Dewhurst: Oh, I don't know. There's talk by one or more who want to run for Congress. But I think we in the Senate will agree on a map. Otherwise, it will go to the Legislative Redistricting Board. If I was a Democratic senator, I'd much rather work with my colleagues and agree to a map rather than have it drawn by a board made up of five different Republicans. TT: How soon will maps be ready? Dewhurst: We've got drafts. I haven't had time to really sit down and study them, but I know Sen. [Kel] Seliger has been working hard on them, and trying, again, to draw fair maps that totally comply with state and federal law. TT: Do you expect them to change the partisan numbers? Dewhurst: I'm going to have to look into it. There are a couple of different drafts. But right now, I don't think the numbers change much from what we've seen, certainly over this past decade. TT: Where will you put the four new congressional seats? Dewhurst: Quite frankly, that is going to take a lot of time. I have visited with about a dozen of our Texas congressmen and women. I know what they want to see in maps, and I think it's too early to speculate. I really want our lawyers to scrub these different congressional maps before I start commenting on them. TT: What about the Bradley and Lowe appointments? Do they get to the Senate, or do they lapse? 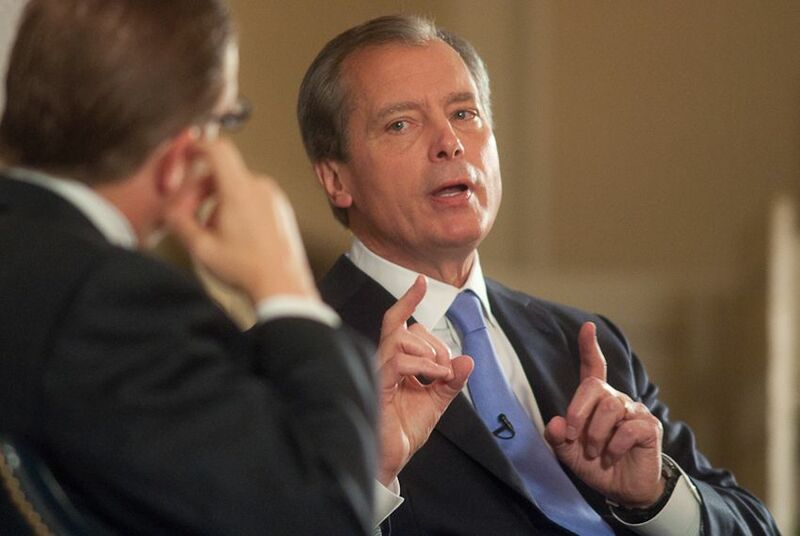 Dewhurst: You know, I've always liked John Bradley. I think he's an excellent, excellent district attorney. I think his heart is in the right place. I think he's very knowledgeable. I think he cares about people. But I think right now it's going to be a hard sell to change some senator's minds on him, mainly those of our Democrats. Dewhurst: I'm optimistic, but she's going to need to spend some time walking around and talking to people. She's a good person. She tells me that the criticism people have of her is not well-founded. In other words, she hasn't said some of the things that they think she's said and that the complaints about the board are not well-founded. TT: See any wild cards here? Dewhurst: Anything can be a wild card right now. Not today. Not that we can't handle. The most important thing today is the budget. It's not a secret that I was pushing the use of a little more non-tax revenue items than some of the senators wanted. And at their request, I have agreed to a contingent budget provision that new available revenue certified by the comptroller —up to $3 billion — shall go first to that budget provision, and that if there is a shortfall, that it will be back-stopped through appropriation out of the Rainy Day Fund. I'm hoping that that's not going to be necessary. I believe, and I think the LBB believes, that the comptroller's estimates are on the conservative side, and we'll see more increase in available revenue over the next two years. Keep in mind that during the first eight months of fiscal 2011, our total state revenues have increased 10.7 percent, or $2.3 billion. TT: Tell me where you think this budget conversation between the House and Senate will hinge. Dewhurst: I hope this doesn't get down to a Democrat versus Republican issue. The Republicans and I want to fund education adequately and keep our good teachers in the classroom, and we realize that the Senate budget is bare bones. But it's essential that we provide an adequate budget. And we don't have a choice in Medicaid. If we're in the program, then we've got to fund our requirements. The Senate budget includes $3 billion of additional bonds for highway construction, which will mean about $8.1 billion when you add in funds from the gas tax and federal funds to build new highways. And I think that's important. Texans want that. We put a couple hundred million dollars more in our prison system, because we wanted to make sure our prisons are safe and we're not paroling people we shouldn't parole. So I think the Senate budget is a good budget. I strongly support it. I think the issue is, can we get 21 votes in order to bring up the budget and pass it? And, provided we keep a provision — even though it's a backstop, shortfall, we may not have to use but a small portion of the $3 billion contingent appropriation — in the budget, we're going to need 21 votes to approve that. And if we don't have the Democrats' support and the revenues don't grow quite as fast as some of us believe, then we may be in the difficult spot of proration on our schools. We want to fund our schools, not lavishly but appropriately. We want to make sure that we're keeping the good teachers that we want in the classroom. TT: Do you have all the Republicans? Dewhurst: I believe that Sen. [Dan] Patrick will be supportive of the budget, if that's your question. There are a couple of Republicans that we were talking to [Tuesday] night and during the day. It's my goal to have all of the Republicans, and it's been Sen. [Steve] Ogden's goal to have four, five or six Democrats. I don't know that we'll get four, five or six Democrats. I'm starting to see some real partisan posturing, trying to embarrass me and the Republicans by a couple of Democrats, trying to block us from passing the budget and put us into special session. That's outrageous. I've never seen that in my eight years, but you've got two or three very vocal Democrats right now who are trying to block this budget and don't want us to pass it. It can't be for any other reason than pure partisan politics. If public education is as important to the Democrats as to the Republicans, then why wouldn't you want to fund it adequately like the Senate does? If taking care of the elderly, frail, and disabled children is as important — people who cannot help themselves — if that's as important to Democrats as it is to Republicans, then why wouldn't you want to fund federal law? And that's where the Democrats are heading. Why in the world would you want fifty or sixty thousand elderly people out of nursing homes and cause all of the Medicaid nursing homes to fail? Why would you want to do that? It doesn't make sense. I don't think in their hearts that the Democrats want to do that, but several of them are being very, very partisan right now. TT: Their argument seems to be that you could get a better budget. Dewhurst: How, my friend? First of all, I think the Senate bill is adequate. I honestly think the Senate bill is adequate. And we are working our way out of this structural shortfall. I was the first one back in 2006 to tell the senators, and I told the press, "Oops. You're being fed a story here. When we cut local school property taxes by one third — $7.1 billion a year — this new gross receipts tax doesn't come anywhere near where we're being told it will. We're going to have a structural shortfall." I've been saying that over and over again. But I've also said, over time, if we keep our spending under control and our revenues grow, we will grow out of it. By reducing our current spending by $11 billion, by reducing our current spending of general revenue by approximately $9 billion, with revenues increasing, we're moving in that direction. There's always something all of us would like to change in a budget. In 2003, we were in the same situation and the Democrats rallied with the Republicans and we passed a bipartisan budget. And I'm seeing a couple of senators right now trying to lead a very partisan, hard-edged effort to block the budget right now. TT: Which senators are you talking about? Dewhurst: I'd rather not get into naming senators. But we need to all remember that we're here to put all Texans first. Let's work together and get this done.